I always get super excited when I have a new favorite food find to share with you guys! Its no secret that I love a good protein bar, and the more great tasting and natural it is, the better. While most of the time, I make my own protein bars, I also do buy them pretty often, and also take them when traveling, or if I’m out all day and not around a fridge. I was given all the flavors to try through a blogger program, and I will tell ya right now, if they were gross, I wouldn’t be posting about them! I get food items sent to me all the time, but I only post about the ones that are good that I’d eat again. As soon as I got my hands on these, I pretty much took a bite out of each bar (totally my style). I would describe these bars as being soft, and almost a nougat type texture. There are no chunks in any of the bars, and they all have this layered effect! They are light tasting and the flavors aren’t too strong. The sugar cookie flavor is probably the mildest, compared to the chocolate mint, which has a more pronounced flavor. I had a really hard time deciding which one I liked best, but I think its probably the peanut butter, chocolate mint and cinnamon roll (as it really did remind me of a cinnamon bun!). The peanut butter really just tasted like peanut butter. As you can see in this pic below, they are super soft when you bite into them….very nougat-like. 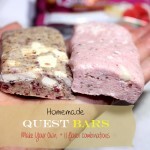 A lot of people compare these bars to Quest bars, but I don’t find it to be the best comparison as they are actually quite different. Even though both bars use IMO (isomalto-oligosaccharide which is a prebiotic fiber), B-Up bars are a much softer bar and don’t have chunks. B-Up bars melt faster if you warm them up, and their flavor offerings are much different than other brands. They really do have their own thing going on! If sodium is a concern, the B-Up bars have less than most other bars. The highest is 135mg per bar. I must say, I really love the ingredients in these bars! In all of their bars, they use natural sweeteners (stevia, xylitol & monk fruit). They also contain whey protein isolate, lots of fiber (from the IMO)and natural flavors. Nutrition per 1 bar: Cals: 210 Fat: 9g Carbs: 24g Fiber: 18g Sugars: 2g Sodium: 120mg Protein: 20g So with all that fiber, the net carbs are essentially 6 grams. These bars are in GNC’s in the US, and if you’re in the US, you can get them directly from the B-Up website. If you’re in Canada, Popeye’s has B-Up bars and luckyvitamin.com, nutrition.com and vitacost.com all carry B-Up bars and ship to Canada. But if you’re in the US, there is free shipping when you order directly from the B-Up website, you may as well order online, and you’ll probably get them cheaper as there are some coupon codes below! The trial pack is normally $17.49 for six (6) bars with FREE shipping. But, if you use coupon code: yuptrial , you can purchase the six-flavor Trial Pack for $13.99 with FREE shipping within the USA. 6 bars for $14 (only $2.33 a bar) which is a great deal if you ask me! So there ya go! If you’re looking for a new bar to try, I totally recommend these! My hubby really loved them as well, so we’ll definitely be getting more! Have you heard about them or tried them yet? If so I’d like to hear what you think in the comments! They may throw you out of ketosis if on a ketogenic diet! Have you tried their chocolate chip cookie dough flavor? It is to DIE FOR! I got my trial pack in the mail yesterday. They had probably been on the mail truck all day, because they were hot when I took them out of the box. I tried the peanut butter bar today. The taste was great. The texture was not nearly as chewy or hard as a quest bar, but was not super soft either. It had a medium firmness. I will let you know if it is filling, as I just ate it. Normally I get 2-3 hours out of a bar, before I feel any kind of hunger pangs. Over-all, very happy with the bar and would definitely recommend. Hi! For our Canadian friends. Popeye’s has B-Up bars and luckyvitamin.com, nutrition.com and vitacost.com all carry B-Up bars and ship to Canada. Thanks! Kim, they don’t ship to Canada (yet). Hopefully soon! I’m close to the US and have a mailbox in the states. Just went to order them, but I think it’s only free shipping in the USA 🙁 I’ll have to remember to pick some up next time I’m in the States, they look really yummy! !